Lunacy is played on a rectangular field that is 54' by 27'. This field floor is referred to as 'Regolith'. The regolith is designed to interact with robots, which must use a special mandatory wheel that may not be altered, to have reduced traction. This is supposed to mirror the effect of driving with low gravity on the moon. Lunacy is played by two alliances of three robots each. 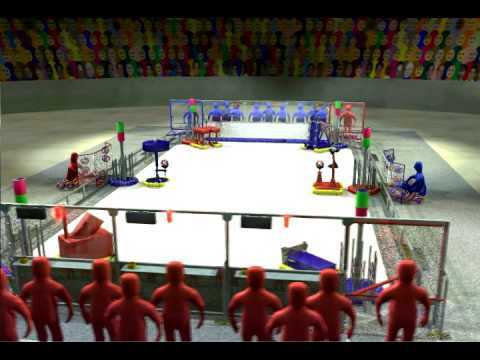 The objective of the game is to score points by placing moon rocks (worth 2 points when scored) in the opposing alliance's trailers, which are dragged around by each robot. Empty cells (worth 20 points when scored) may be delivered to human players to be used later as "super cells". During the last 20 seconds of a match, supercells (worth 15 points when scored) may be put into play. Team 1114 entered 2009 looking to defend their World Championship title. Going into the 2009 season, Simbotics helped found two new rookie teams, Team 2809, "Kbotics" at Kingston Collegiate and Vocational Institute in Kingston, ON and Team 2852 "Redmen" at Dennis Morris High School in St. Catharines, ON. Team 1114 won their third Regional Chairman's Award, this time at the Greater Toronto Regional. Simbot "Panthro" was created hoping to distinguish itself from the field, and succeeded being regarded as one of the best "shooters" in Lunacy and taking home a regional victory at the Greater Toronto Regional and a design award. Team 1114 seeded first at the World Championships, becoming the first ever team to earn a Championship first seed in consecutive years. Unfortunately the team was defeated in the semi-finals, by the eventual division winners. After regional awards at Midwest and Greater Toronto regional, simbotics.org also took home the award for the Championship's Best Web Site. Chairman's Presenters: Matt C., Candice E., Ryan S.